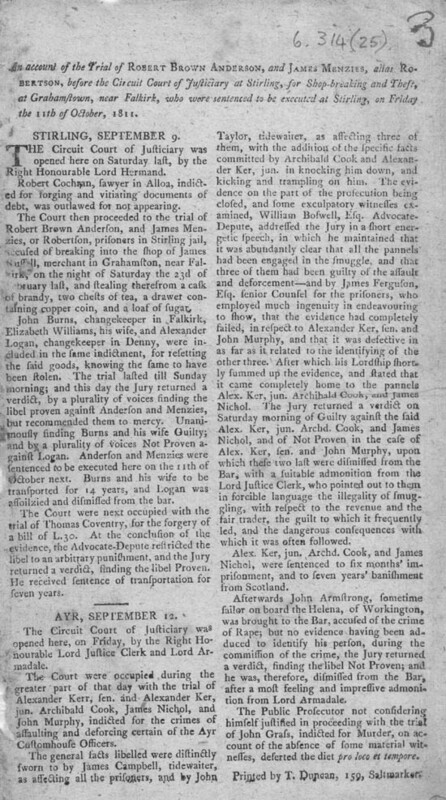 This execution notice begins: 'An account of the Trial of ROBERT BROWN ANDERSON, and JAMES MENZIE, alias ROBERTSOn, before the Circuit Court of Justiciary at Stirling, for Shop-breaking and Theft, at Grahamstown, near Falkirk, who were sentenced to be executed at Stirling, on Friday, the 11th of October, 1811.' This sheet was published by Thomas Duncan of Glasgow. Thomas Duncan operated in the Saltmarket area of Glasgow between 1800 and 1823. Among his speciality productions were court lists and execution notices. Due to competition in the area, however, he often used information from places further away. The most sensational verdict was that for Anderson and Robertson, who were sentenced to hang for breaking into James Russell's shop. There are, however, another four cases for this court circuit mentioned, as well as a list of those tried at Ayr Circuit Court, held on the 12th September.